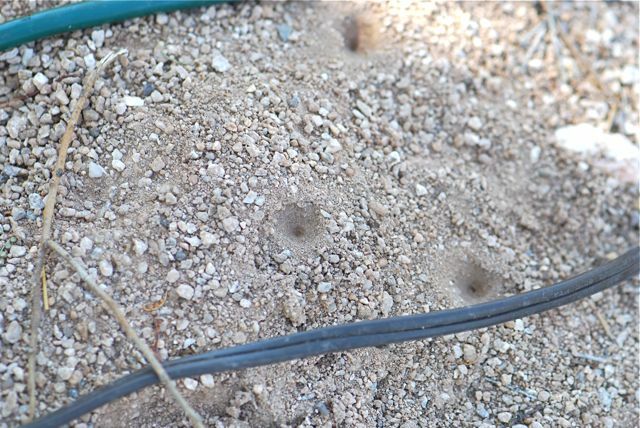 The leafcutter ants were busy in Tucson a few weeks ago. 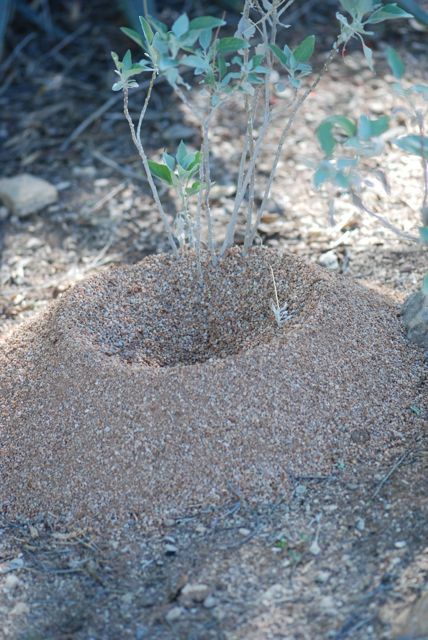 Check out this mound the ants had constructed. Most of the workers I saw were carrying clumps of dirt/pebbles. The worker dumped her load and then went back for more. The surface of the mound looks like a boulder field from the perspective of the ant. 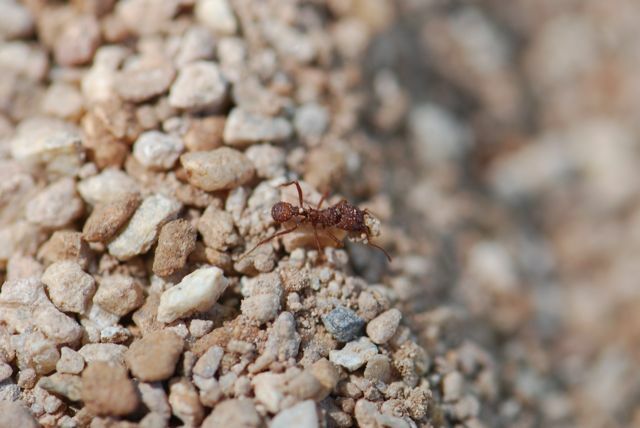 A curious docent wondered why I was taking photographs of the ants. After wishing the mound was in the sun, she volunteered to show me another mound she knew of that she thought might be in the sunlight. Turns out it wasn’t in the sun, but there was something else there. You see those cords? A crew that was stringing Christmas lights had trampled the leafcutters’ mound. I’m not sure whether the ants simply reverted to another entrance or whether they abandoned the nest. I was intrigued to see those circles though. Do you know what they are? 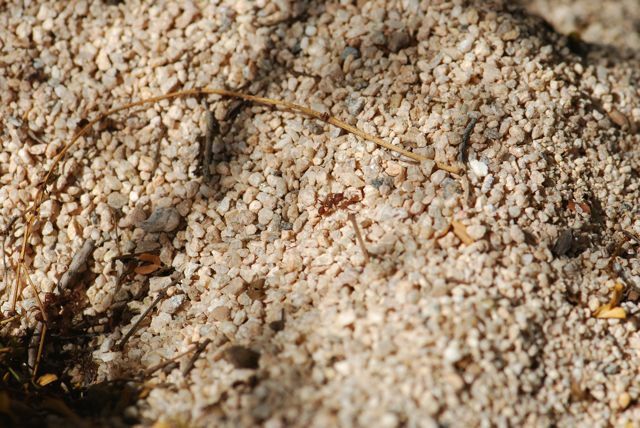 Antlions seem to prefer fine, powdery soil (The Antlion Pit). 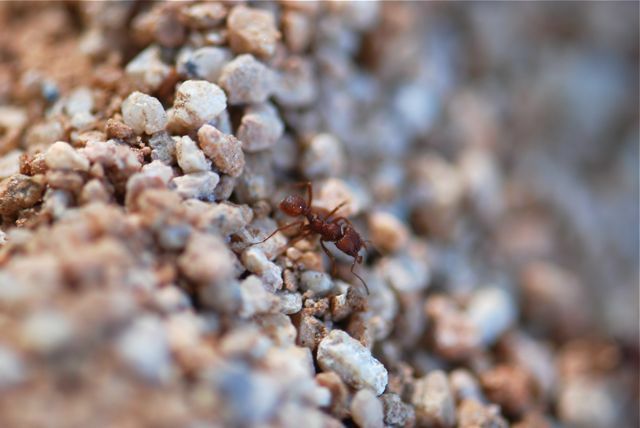 So, do you think perhaps ants may decorate their mounds with pebbles in an effort to keep down antlions, as well as other species of ants as has been suggested? Do you know of anyone who has studied this possibility?